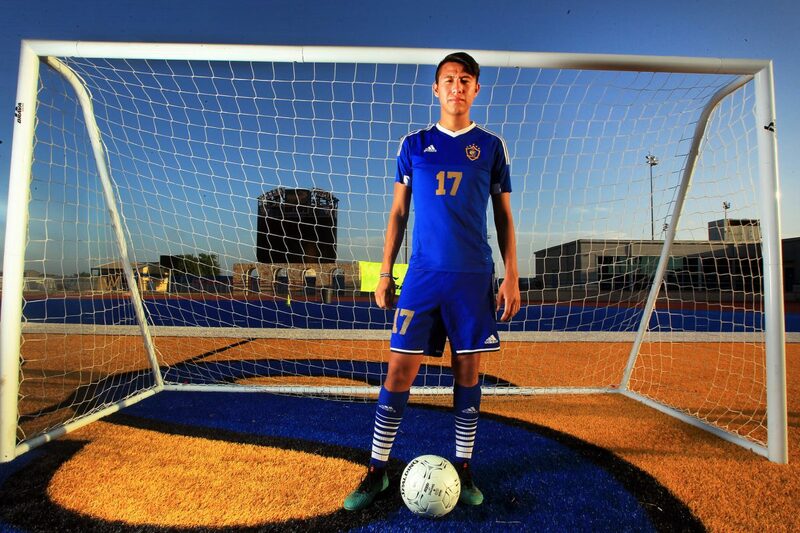 Valley View's Mario De Los Santos, Player of the Year, poses at Valley View High School on Thursday, June 7, 2018, in Pharr. Valley View striker Mario De Los Santos has a nose for the net, a connection with the corners and a tendency for the twine. His skillful footwork, laser accurate shot and ability to create and utilize space helped him become the Valley’s top goal scorer and The Monitor’s All-Area Player of the Year. Near the net or closer to the midfield line, De Los Santos was a threat to take a quick windup and challenge a goalie from any distance. On the road in a second-round district game, he received a pass just after the whistle to begin the second half. His shot was a perfect rainbow over the keeper’s head to give the Tigers a tally just moments into the frame. His dedication to training and being on the field almost has no limits. His last class of the day before soccer practice was study hall, and his coaches had to make sure he actually finished all of his work. Usually, he was stretching and asking for a ball even before the bell. The spectacular became routine for the junior. At times, even multiple-goal performances felt like a walk in the park. He had seven regular-season hat tricks and 59 goals before the playoffs started. Assistant coach and 2012 Valley View graduate Israel Lince said De Los Santos’s intense work outside of games and practices allows him to play with style and finesse. His physical and technical skills are one aspect of his game, but head coach Damian Magallan noted De Los Santos’s knowledge of opposing defenses. The striker can manufacture chances and space by drawing markers away from a play. In the playoffs, the goals continued coming from De Los Santos and the Tigers supporting cast. He booted three more postseason hat tricks, including in the regional final game against Brownsville Veterans in Corpus Christi. When the dust settled and Valley View was eliminated by back-to-back state champions Frisco Wakeland, De Los Santos clearly wasn’t just happy with a 70-goal season and a trip to state. Valley View and De Los Santos’s hard work will begin earlier this season, as they move into the “district of doom,” District 32-5A, due to UIL realignment, joining Lower Valley powerhouses like Brownsville Veterans, Lopez, Pace, Porter and Donna High.